Leasing Retail Space to the Franchise Tenant, A Check List for the Retail Franchise Lease, and the Lease Clause Critique: The Pro-Landlord Rider for the Franchise Retail Tenant. A great many franchise retailers are desirable tenants. Several franchise operations are in the who's who of retailing, especially in food service (i.e., restaurant operation), and consistently turn in sales per square foot that lead their industries. They are well managed. Their advertising budgets are huge. Consumers know them and patronize them; they are a familiar commodity, like Kleenex or Pepsi. And for shopping center landlords, food service has become one of the keys to keeping customers in their malls for longer and longer shopping trips. The longer the customer's visit to the center, the more that customer is likely to spend there. Good food in the center means patrons can shop all morning, eat lunch, regroup, and then shop all afternoon. As if that's not enough, the failure rate of the franchise tenant is lower than that of their mom and pop competitors. They come with the management expertise of their franchise organizations, who've been in business for a while. Generally speaking, they know what it takes to succeed in the market. 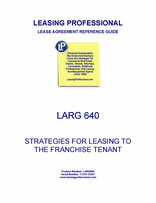 In some cases, the franchiser tenant has not made a final decision during lease negotiations whether the space will be used for a "company store" (i.e., an outlet operated directly by the franchiser with its own managers) or for a franchise location (i.e., one operated by a licensee of the franchise operation pursuant to a franchise agreement). If the location is to be a franchise operation, often the franchiser has not made a final decision concerning which franchisee will manage that location when the lease is negotiated. This makes the landlord nervous. How can a landlord competently negotiate a lease for its shopping center when it doesn't know who is to occupy the space, or what the franchisee's business experience, financial strength, and operating expertise are? There may be conflicts between the lease and the franchise agreement negotiated between the franchiser and the franchisee. Both documents are comprehensive, and regulate the same business—the one to be conducted in the premises. Both agreements cover kindred issues such as trade name, manner of operation of the business, alterations to the premises, rights and obligations to install and remove signage, advertising, financing and security interests, subordination, termination rights, and so forth. In a franchise deal, there are normally three parties (forgetting the lender or financing entity)—the landlord who controls the space, the franchiser tenant (i.e., the franchise organization) and the franchisee, who is the ultimate occupant of the space. Normally the franchiser tenant will negotiate the lease, and then sublease the premises to the franchisee after the franchise agreement is signed between the franchiser and the franchisee. Each of those parties in a franchise deal has its own perspective and distinct slate of objectives for the lease, as follows.